The existence of water in the soil pores poses a uniquely difficult problem in the mechanics of multiphase materials. Being controlled by the so-called Terzaghi's effective stress in the case of fully saturated soil and by the Bishop's effective stress and suction in the case of unsaturated soil, soil deformations cannot be correctly assessed without the determination of pore water pressure. 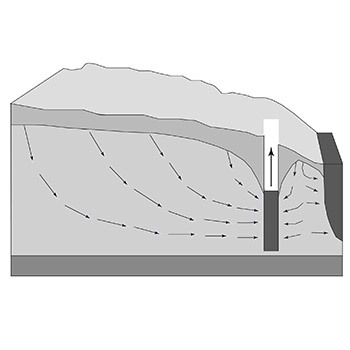 That requires the calculation of ground water flow before one can proceed in the deformation analysis. Analytical solutions are available for flow problems with simple boundary conditions. However when the boundary conditions are getting complex then the use the more advanced Finite Element Method is unavoidable. WeSI Geotecnica can handle a wide range of possible boundary conditions such as infilitration, evaporation and a water head varying with time. It also benefits from well-known suction-saturation models such as van Genuchten's equation to better simulate the unsaturated flow. Hence, WeSI Geotecnica offers accurate numerical anaysis dealing with saturated and unsaturated water flow.